The Machu Picchu ticket office in Aguas Calientes, Peru closes at 9pm, and our train pulled in at exactly 8:52, giving us 8 minutes to get to the ticket office. We sprinted off the train in our backpacks, through the maze of shops, across a zig zag bridge, and in the general direction that people along the way kept pointing us in. We found the office at 8:57, yet the doors were locked shut. Panting, we knocked on the door. Someone opened the door a crack, then refused to sell us tickets, saying to come back tomorrow morning. Another man came and asked us to hand him our passports, saying he would go buy our tickets. Naturally, we were a little wary about giving away our passports. We decided to just wait a few more minutes outside. He must have felt some pity for us, because he came back and let us in, and we got to buy our Machu Picchu tickets! Afterwards, we successfully navigated our way to the hostel, and slept in our only slightly sketchy room, complete with fleece blankets featuring giant wolf faces. My iPod alarm went off promptly at 3am, and we got dressed for our adventure. The goal was to climb Waynapicchu, the big mountain on the right side in pictures of Machu Picchu. It’s an internationally recognized heritage site, so they have very strict regulations. They only let the first 400 people in. 200 at 7am and 200 at 10am. We had to get up early enough to be one of the first 400 people at Machu Picchu because these first 400 get stamps on their tickets allowing them to climb Waynapicchu. It was me (from Louisville, Kentucky), Cari Jeffries (from Pasadena, California), and Anna Greer (from Seattle, Washington), all Awamaki volunteers, on the trip. We went down to the front desk at the hostel, and knocked on it as we had been instructed, so that someone could unlock the front door for us. A half-asleep woman in her pajamas came down with a bunch of keys, and had to try each one in the lock on the door, one by one. If there had been a fire, we would have certainly all been dead by the time she found the right key. Once she finally found it, we left and walked through the completely silent, deserted streets of Aguas Calientes, not passing a single person on the way aside from the three people asleep on benches in the plaza, and a few stumbling home from a bar for the night. It was odd to be going out for the day at the same time that some people were going to sleep for the night. We found the bus station, and the girls in front of us informed us that we were about 60th in line. This would definitely guarantee us a spot in the first 400 people, or at least we hoped. We had our Machu Picchu tickets, but still needed bus tickets. The bus office opens at 5am, so we were going to send one of us over there around that time to get the tickets. I headed over around 4:50. There were probably 20 or 25 people in front of me, but I hoped that we’d get through those 25 people before the buses loaded the 60 people before us in the bus boarding line. I was very wrong. The bus ticket line took ages. I don’t know if people didn’t have their passports, or if the lady at the desk was just the slowest person on the planet, but I had to wait in that line for almost an hour. Meanwhile, the bus boarding line was moving, and the first groups of people were heading to Machu Picchu. Cari and Anna had to wait until I finally ran over with tickets. Unfortunately, hundreds of people had already boarded. It didn’t look like we had much hope for Waynapicchu, but we got up at 3am and we absolutely were not giving up now. The bus arrived at Machu Picchu, after the dozen switchbacks up the mountainside. After waiting in another lengthy line to enter Machu Picchu, we finally got in! We power-walked through the breathtaking ruins, open-mouthed and in awe, to the other side, where the Waynapicchu gate is. We begged for a stamp to enter, but all 400 had already been given out. It was 6:30, and they said we’d have to wait here till 8:40 to see if any of the 400 didn’t show up. So we waited. I had purchased 8 round pieces of bread from my host mom’s store for 20 centimos each, or the equivalent of 7 cents each. I can’t remember a single time in my life that I’ve bought something for only 7 cents, but I chomped down on some of those delicious pieces of pan as we waited for the verdict. Everyone with the special stamps entered, and around 8 another line started forming. We asked what it was for, and they said it was where you should wait if you didn’t have a stamp and still wanted to enter. We wished we would have heard about this line an hour ago so we could have gotten in the line rather than sitting on the rock next to the line. A man walked out and announced that he could let in 20 additional people. Anna ended up being the 20th, and Cari and I didn’t get in. The three of us begged and pleaded at the desk. In broken, wrongly conjugated Spanish, all three of us simultaneously told them we got up at 3am, and we were here so early, we would have been the first in this ‘extra people’ line if they would have told us to wait in it rather than saying to wait “around”. Finally, they told Anna to just sign her name, and very subtly motioned for all 3 of us go to, and said not to tell anyone. We were overjoyed. The little man who let us in turned around, and I just gave him a big hug from behind, and he looked over, half smiling, not knowing how to react, as Cari gave him a hug too. We charged off on the trek, and once we were out of sight of the men, we squealed and hugged each other. 5 hours of lines and lines and confusion and more lines had finally paid off! The struggle it took to get there just made the taste of victory so much sweeter. Plus we got to break international law maybe? Which is something every person wants to do in life. The hike was absolutely breathtaking. The view from the top was completely surreal, and I don’t think I stopped smiling the entire two hours we spent up there. There were mountains on every side of us, and we had a birds-eye view of Machu Picchu. It was one of the most beautiful things I’ve ever seen. We eventually decided we should actually explore what we came here for, Machu Picchu itself. We climbed down the mountain, to see two new men working the desk, watching everyone as they signed out. They were watching a little too closely for our liking. We nervously looked at each other a little, and Anna signed out. Then I walked up, looked around for a blank spot to sign, and ended up signing out as some random person. Poor Maria Fernando Hayes probably had a bit of confusion when she went to sign out and someone had already done it for her! Machu Picchu was incredible, Waynapicchu was amazing, and we topped off the day with some delicious pizza, chocolate cake, and hour long massages. It was the perfect end to the perfect day. My name is Marie Clements, and I’m working with Awamaki’s Education project. I’ve been here for 6 weeks so far, I’m from Louisville, KY, I go to school at UNC Chapel Hill, and I LOVE working with Awamaki! 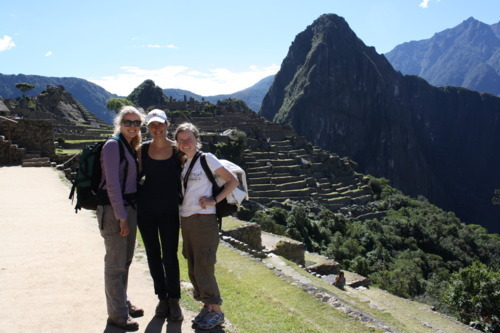 Cari, Anna, and I at Machu Picchu. The mountain behind us on the right is Waynapicchu!